This bayfront upgraded two-bedroom, two-bath condo is the perfect place to live the Mission Beach lifestyle on beautiful Mission Bay. The Pacific Ocean is less than a minute walk. Located on the second floor, the roomy balcony offers a nice view of the boats and water. Use the BBQ as you watch the boats sail on the bay, or watch the sunrise over bay with your morning coffee. The kitchen is brand new and many other upgrades have just been completed in November 2011. There is both a stairway and an elevator, so you get to choose your access to the condo. With nearly 1200 square feet of living space, there is plenty of room for one or two families to enjoy the vacation that you deserve. Belmont Park is a ten-minute walk, and you can drive to Sea World in five minutes. The hip Gaslamp District, Downtown, Petco Park, and the airport are just a 10 - 12 minute drive, as is luxurious La Jolla, home to movie stars, artists and a large family of baby seals. Mission Beach is San Diego's best beach, for both kids and adults, there is something for everyone. Book now for a great time in beautiful Southern California. This condo sleeps 9 in beds and pullout sofa and we also have 2 pads for floor sleeping. Directly on the bay front! Walking distance to restaurants, grocery, and beach. Great view of the bay with lovely sunrises. Dave was great and responded to our requests promptly. Nice kitchen and front bath. The beds and bedding are just ok, but for the price and location I would probably return. Centrally located to both Bay and Beach. Large and easily accommodates a large group. I would highly recommend bringing your own bedding, pillows, and towels. 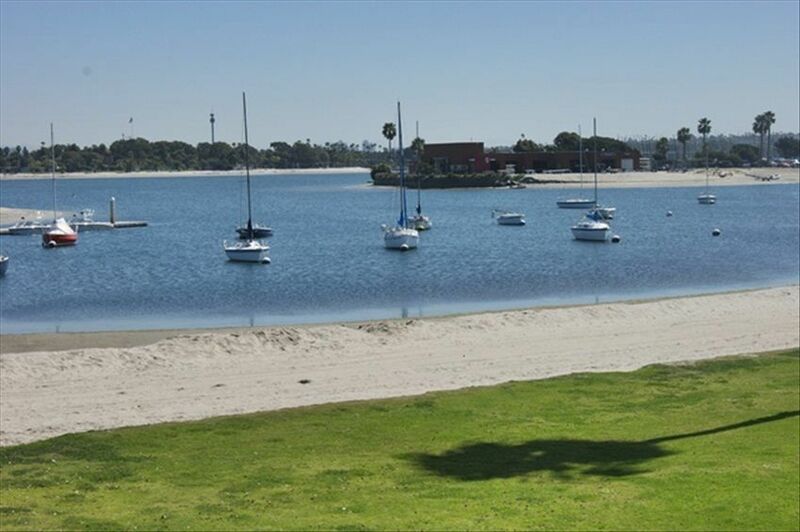 Nice condo for people watching and for experiencing the wonderful environment of Mission Bay and Mission Beach. The condo’s upgraded kitchen is very nice and the view of the bay from the balcony is nice also. Wish it was a bit warmer in March though. There are many restaurants and shops nearby on Mission Boulavard which we enjoyed. Parts of the condo could use some sprucing up a bit, and there was an elevator problem that was resolved. All and all it was a great rental and we had a great time. This property is fairly outdated and in need of repair. The fact that there was no central heat was disappointing. the television has something wrong with it and the internet did not work periodically. It would be helpful you would report anything that is not working correctly. The tv only had a loose cable and could have been fixed immediately. There might have been a temporary interruption on the internet, but it generally is very reliable. I'm sorry you are dissatisfied. Most of the guests have given us very good ratings. Beautiful place I really enjoyed my stay! Loved the close proximity to everything!